Former NBA champion Michael Jordan married his girlfriend of five years, Cuban model Yvette Prieto, on Saturday, April 27, in a jaw-dropping 40,000 sq ft tent. According to local realtors Jeff and Cary Lichtenstein, Michael Jordan and Yvette Prieto’s venue is the “largest tent in wedding history,” and is actually 5,000 square feet larger than their home. Jeff Lichtenstein, who took the photos of the wedding venue, markets homes in Jupiter and Palm Beach real estate for sale. Michael Jordan, 50, and his new wife, 34-year-old Yvette Prieto, hosted upwards of 2,000 people at their Palm Beach wedding, according to People magazine. Yvette Prieto and Michael Jordan got engaged in 2011 after dating for three years. Michael Jordan was previously married to Juanita Vanoy from 1989 to 2006. 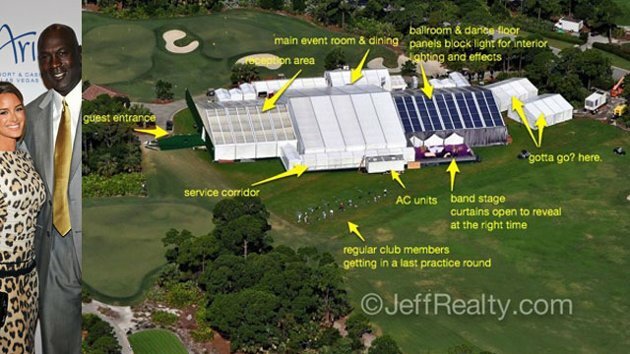 The newlyweds’ 40,000 sq ft wedding tent was placed on a golf course and was designed by Jack Nicklaus. More than 2,000 guests have been invited to join the couple for their reception at the Bear’s Club golf course in Jupiter, Florida, which is just feet away from Michael Jordan’s sprawling Florida mansion that is 5,000 sq ft smaller than his wedding tent. Michael Jordan’s enormous home was deemed too small for the couple’s reception so he had to resort to erecting the tents, the size of three football fields, for the wedding revelers. “I’ve never seen anything like it. I’ve been working weddings for a while. It looks like he’s having about 2,000 people over,” and unidentified insider told GossipExtra. On Thursday, a crew of 50 staffers spent the day on setting up three tents in the backyard. On Friday, employees set up a sound system for the fete. The equipment is said to have arrived in four semi-trailers. Musicians in the wedding band were heard practicing on Friday and golfers who were playing on the course were said to have enjoyed the set list. The wedding tent allowed guests to enter in a spacious reception area that leads into a dining room. Connected was a gigantic ballroom and dance floor, darkened with paneling to allow for lighting and effects. On Friday, the lovebirds and their wedding party descended on the exclusive Bethesda-By-The-Sea Episcopal Church in Palm Beach for their rehearsal. Michael Jordan’s mother was seen headed into the church where her star athlete son is going to get married Saturday afternoon. Though neither Michael Jordan nor Yvette Prieto were seen in public on Friday, they likely were inside the church as they prepare to wed.
Local police have been ordered to order back up security for the church between the hours of 2 p.m. and 6 p.m. on Saturday, giving the crew of revelers more than enough time to arrive, attend the ceremony and leave. Bethesda-By-The-Sea is the same church where Donald Trump married his third wife Melania in 2006. Earlier in April, it was the venue for the memorial service for socialite designer Lilly Pulitzer, who died on April 7. Yvette Prieto biography: Who is Michael Jordan's new wife?